Any parent can attest to the seemingly endless barrage of questions from our kids: “Why do I have to take a bath?” “When can we go back outside?” and a staple of long road trips, “Are we there yet?” Children are curious creatures. They ask questions in efforts to figure out the world they live in. Some questions, of course, are easier to answer than others. Common family-related questions such as “Where do babies come from?” and “What is our nationality?” get deeper conversations going, but if you are an adoptive parent, your answers will be a bit more complex and thought-out than the typical response. Children’s understanding of adoption is part of a developmental process, and asking questions is their attempt to try and understand its role in their lives. At Adoptions With Love, we want parents like you to feel prepared for their children’s more difficult adoption questions. We want you to have the confidence, compassion, and ability to comfortably discuss adoption – openly and honestly – with your child. Depending on your child’s age, certain adoption-related questions will require simpler answers, such as: “Was I in your tummy?” This is one of the more common questions asked by young children. The answer can be handled with a simple reply, such as “You were in your birth mother’s belly before you were born. Mommy and Daddy wanted a baby but could not have one that way. 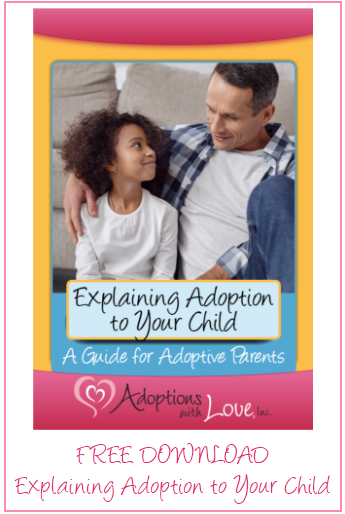 We were so excited to adopt you!” It is important to take age and development into consideration before addressing your child’s adoption questions. It is also important to always be open, honest, and positive when talking to your child about adoption. 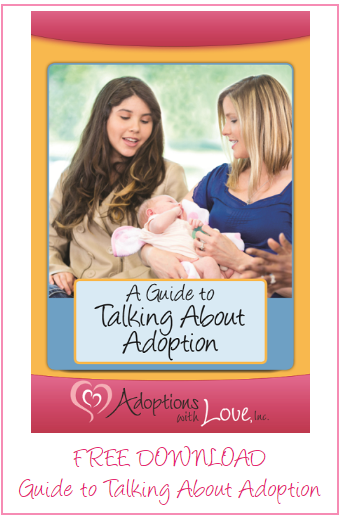 To help you navigate conversations with your child, Adoptions With Love has compiled a list of other common adoption questions that children may ask, ranging from the basic ponderings of a preschooler to the adolescent interrogations. Adoption Question: What do my birth parents look like? Answer: If you know what the birth parents look like, describe them as detailed as possible. Example: “Your birth mother has brown, curly hair and big, beautiful green eyes.” If you have a pictures of your child’s birth parents, this would be an appropriate time to share it with him/her. “They must be stunning to have made such a beautiful child like you!”Adoption Question: Why didn’t my birth parents keep me? Adoption Question: How come I don’t look like anyone else in the family? Adoption Question: Why did you adopt me? Adoption Question: Will I go back to my birth parents someday? Adoption Question: Is it okay to think about my birth parents? Like many adoptive families today, you may have opted for an open adoption. Depending on your relationship with the birth parent(s), you may arrange for the birth mother speak with your child at certain points of his/her childhood, particularly when questions are raised about your child’s birth family history, the birth parents’ feelings on the adoption, or any other personal questions related to your little one’s biological background. This approach is completely up to you and what you, your child, and his or her birth mom are comfortable with in terms of contact. ← Local vs. National Adoption Agencies: What’s the Difference?